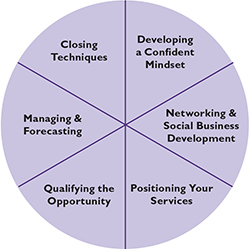 In many professional businesses, professional specialists, consultants and non-sales individuals are required to take on a customer-facing business development role. Without the necessary skills, they are going to be at a distinct disadvantage. Learning Partners has designed a program of easy-to-use modules to demystify the sales process and help you to learn fast, useful and proven consultative sales skills to help increase your business with existing and new clients alike. Selling for Non-Sales Professionals can be delivered as a one or two day course, dependent on the modules required. We recommend between six and twelve participants per course in order to ensure a high level of engagement with each participant. Modules include practical exercises, small group working and role-playing to reinforce the training and embed and test the individual’s understanding of each new skill. Learning Partners provides two expert trainers per course; one a consultant qualified in applied neuroscience and behavioural skills and the other a sales professional with over twenty years experience in sales and sales management including VP of European Sales at McAfee. Created a sales process to keep track of and follow up opportunities. Each course can be tailored to your specific requirements and can include modules to deliver either a one or two day course. Learning Partners can embed this training with our cloud-based e-Learning Pathways software, which, together with our expertise in training and coaching, offers a comprehensive end-to-end learning solution. 70% occurs in the workplace from on-the-job experiences, working on tasks and problems. 20% from feedback and coaching by people supporting the learning. 10% from professionals, such as trainers and mentors and is essential to establish best practice, tools and techniques. This interactive software with feedback from a Learning Partners mentor embeds new skills and reinforces learning, typically in a six to ten-week period, whilst the individual is performing their daily work. Please contact Learning Partners for more information.